When I got home from work yesterday I was exhausted. My part time job isn’t hard but it can be very draining just being in a windowless space for 8 hours without talking to people that much. I scarfed down a plate of spaghetti and was still hungry so I decided to whip up another apple dessert from my apple picking festivities. 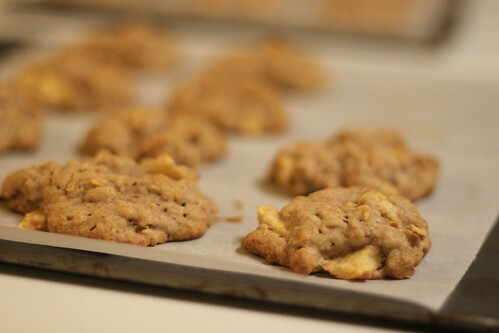 I decided to whip up a batch of apple oatmeal cookies. 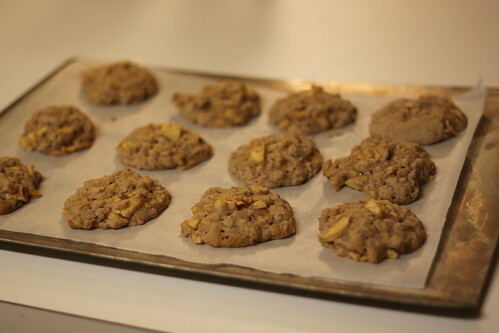 They were quick easy and only made 2 dozen cookies which is good. I’m looking for lots of small things to make with all these apples. I think I may try apple sauce next, my husband loves that. I wonder if I’ll be sick of apples by Friday?